The Paris set is a very well balanced set which provides a wide range of colours. 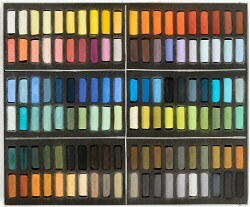 The Sennelier pastels were first introduced at the turn of the 20th Century. Whilst the colours and tones have evolved the making of the pastels themselves has remained relatively unchanged. Schmincke pastels are a joy to use. Being one of the softest pastels on the market they provide excellent colour release that has intensity and depth. Highly recommended. Rembrandt pastels are towards the harder end of the scale in terms of softness. This allows many techniques and effects to be implemented which are a lot harder with the very soft pastels. They have very good lightfastness and are free of pigments based on lead, cadmium and cobalt. 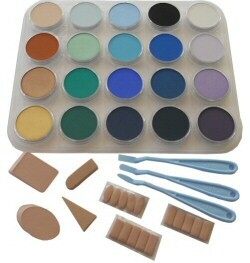 - Set of 80 Pan Pastels and Accessories Now Only $625 - Save $264.95. 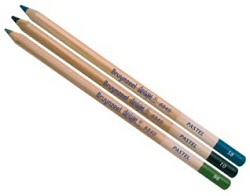 Bruynzeel pastel pencils are rich and buttery, yet firm. They have strong colour release and resist crumbling which is great for finer lines and sharpening. The pencils are 3.7mm wide with the colour strip being perfecly centred within a cedar casing. The well balanced colour range and excellent lightfastness make them a great choice for artists. 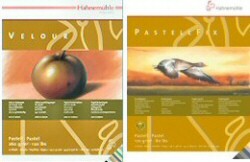 Covers the Pastel Sketch Cotton Paper, Pastelfix Paper and Velour Paper Pads. Hahnemuhle have a reputation for quality papers and the Pastel Papers are no exception. 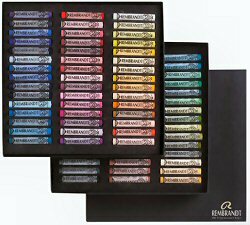 The Art Spectrum soft pastel range includes many colours unique to Australia such as Flinder Blue and Red Violet, Australian Leaf Green and Tasman Blue. A good chance to stock up whilst the pastels are on special. Pastel painting takes you back to the origins of colour. Lying somewhere between sketching and painting, pastels encompas the best of both. Pure enjoyment resulting in beautiful art works. Soft Pastels vary in their degree of softness and we are often asked about this. The list below is arranged from softest to hardest and is based on our experience.